1.g8Q Bf2+ 2.Bd4! Unexpected sacrifice! 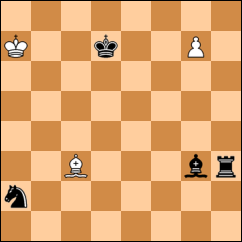 White discharges bR from a forced capture on the next move. 2…Bxd4+ 3.Kb7 (wQ is threatening every black piece) 3…Re3! This move saves the rook and lets Black keep his king on e-file if wQ takes the bishop. 4.Qc4! Quiet attack on Bishop. Thematic try (R-sacrifice, fork) 4.Qd5+? Ke7 zz 5.Qxd4 Rb3+ 6.Kc7 Rc3+ 7.Kb6 Rb3+ 8.Kc5 Rc3+ 9.Kd5 Rd3! 10.Qxd3 Nb4+ draw. Black’s plan works after 7.Qc5+? Kf6 8.Qxe3 Nd5+!= fork.